33.25" x 8" x 7"
The Songye people believe this hideous figure is profoundly powerful. After being embellished with magic materials it could not be touched and was carried by placing two sticks under the arms. Using hard wood a carver created the basic form. After the figure was carved, the officiating priest (Moganga wa kilumba) would pack magical pastes in the hole on the figure's head and insert a horn. Additional materials would be packed in the hole on the torso. 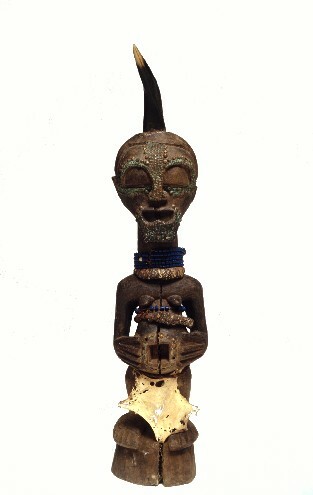 The figure would be further adorned with brass tacks, glass beads and animal skin (note the snake skin around the neck). Its fierce gaze, its mouth agape as if engaged in a blood-curdling shriek, and its specially bestowed magic protected the village against evil and assured prosperity. Bibliography: Cornet, 1978, pp.280-287; Neyt, 1981, pp.261-262.